And April and May 2010 bring us almost to the present! After these releases, everything you hear about should be new new. 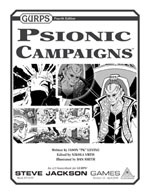 GURPS Psionic Campaigns by Jason Levine. Psi can be challenging for the GM . . . but Jason's advice here makes it a snap. GURPS Alphabet Arcane: Lost Serifs by Stefan Jones. This freebie works with GURPS Alphabet Arcane to transform a set of keen adventure seeds into a campaign. GURPS Big Lizzie by W.G. Armintrout. Dinosaur-sized adventure from the Space Gamer vault, updated to GURPS Fourth Edition. GURPS Psis by Jason Levine. Psi can also be challenging for the players, but Jason has that licked, too. Pyramid #3/19: Tools of the Trade - Clerics. 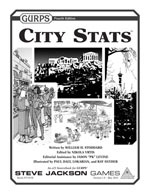 GURPS City Stats by William H. Stoddard. GURPS offers systems for rating characters, weapons, vehicles . . . and, as of this release, cities.